Looking for a pair of Meriah fans. have you given Tara at Hall Pantera a phone call? She may still have them on the shelf. Is this a replacement or an upgrade? I have a pair of stock fans on the shelf if you want them. Hi Julian, I am looking to upgrade, but thanks anyway. 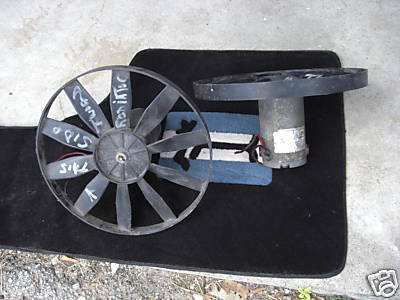 I talked with Brian at Graham Tool and his recomendation is to buy a couple of the newer style flexlite or equivalent fans in the plastic housing from the local auto store and mount directly to the front of the radiator. I have a Pheonix so unless I weld some 90 degree tubes I can only fit pushers and maybe one puller off to the side. What's the general concensus? I have a Phoenix raiators and upgraded to Meriah fans in both my cats. They fit in the original location/brackets, are high quality motors, and have a low amp draw. I have had no problems with them and they keep all COOL! I installed the flex-a-lite twin pushers in my car over the winter. Fit is so good you would swear they were made for this application. Draw half the power and push almost 3 times the air. Not hot here yet but car runs up to 185 and stays there, hot or cold, stop or go. Doug, Do you have a flexlite part number for your dual fans. A perfect fit sounds great! All good info above. Would love to know the Flexalite part number too Doug. FWIW, I rebuilt my stock fan motors - new brushes and soldered in heavier gauge wires and new pigtail connectors. I have Cortina fan blades and work great. The car stays cool, even in stop and go traffic in 100-degree heat. On #7024 I installed a Fluidyne (laid down) and used the dual 12" puller model # FLX-220. The equivalent pushers are model # FLX-240, both available from Summit Racing and others. A word of caution, do not use the supplied mountings (ties which go through the radiator core) as there are numerous stories of them cutting through the radiator tubes with vibration. I fabricated some U shaped brackets that sit over and under the main frame of the radiator. 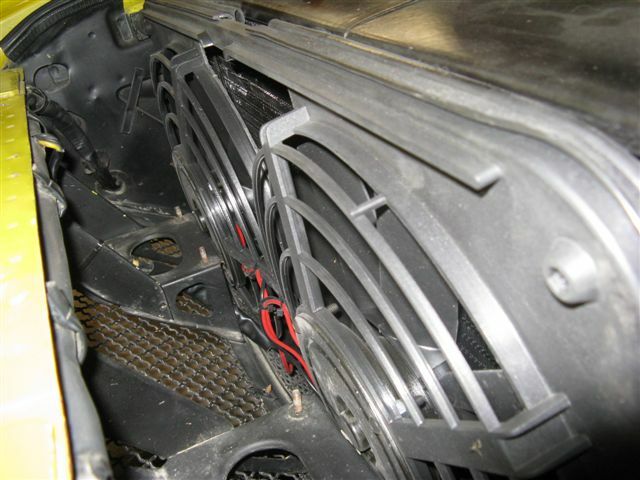 I also used some spacers to keep the shroud (and fan blades) spaced off the radiator a litle. I seem to recall the optimal mounting is something like 1-1.5" from the radiator core to allow correct air draw and flow. Julian, Thanks for the heads up on the ties. I'm not sure we have an extra 1" of space on the pushers in front. Toby, I replied to your PM. Julian is right on. Model #240. 1250 cfm each side if I remember correctly. You will not have an extra inch of space at the bottom. The rubber seal around the fan shroud fits almost perfectly over the rad. I did not fasten the fans at all. Held in place by the bottom rad brace and the top cover plate. Definately do NOT use the plastic through the core anchors. If I can get a descent pic I will post it here. This is a really good alternative if you do not want to install a lay down with suckers. This is a ackward thing to photo. Best I could do. Doug, Thanks for the info and pics! Excellent info, from both Doug and Julian. Thanks guys! I love this forum! I just installed the Fluidyne Radiator straight up. Does anybody know of of my best, easiest andcheapest way to replace the stock fans with new improbed fans that pretty much bolt in the same position as the old stock fans? The perceived easiest would probably be to use the Meriah fans (straight bolt in replacement) or an alternative is to change the exisitng fan blades to a Ford Cortina fan that has 8 (I think) blades for increased air flow. However, both are becoming hard to come by and the Flex-a-lite dual fans are around $220 new, so personally I'd upgrade once and for all to a modern Flex-a-lite system. I just installed the Fluidyne Radiator straight up. Does anybody know of of my best, easiest and cheapest way to replace the stock fans with new improved fans that pretty much bolt in the same position as the old stock fans? While most owners tilt the Fluidyne and use the Flex-a-lite suckers, you CAN use them with the Fluidyne in stock location. You will need to mount the radiator and fans as an assembled unit. No extra room, but doable. In your case though, I agree with Julian - upgrade to twin Flex-a-lite suckers. Or in your case you can always do exactly the same as Doug has done above and opt for the pushers, they are basically the same unit (2500 cfm) with the fans in reverse. Thanks a Million. Even if the fan doesnt work the blades are key! Julian, Thanks for the heads up. I have those same fan blades but my motors are different. I was planning on throwing them up on ebay as I went with the flex dual pushers and a 14" center puller. Strangely enough, the old fan motor in my XKE roadster is almost identical to the fan motor in the Pantera. Both are Lucas. Cool Cat makes a more powerful motor to replace the Lucas for the Jag's and it will fit in the stock brackets with a little work. The Cool Cat motors are pullers so you have to reverse the polarity and the center driver is a bit thicker than the Lucas so you have to retap the fan...but it will fit and will push as much air as the twin Meriah's for about half the price. I have mounted the fans in 2235 with a 12 inch puller from Flexalite. More than enough for a stock motor but can still get warm in stalled traffic after 40 minutes in the summer. This is with a very hot 393 stroker motor. I have ordered the Fluidyne radiator already. Does anybody know what these fan blades might be from? Photo is fromn the ebay listing that Joules linked here a few days ago. Mine had the same as these when I bought it, but the blades are broken so I need to replace. Maybe the Ford Cortina? I think? They are Flex-A-Lite blades. Check the face to confirm the part #. These are on mine. they look the same as mine, unfortunately the part number must have been on the plastic parts that disappeared when the hub shattered.